.....but I LOVE this stuff. To read the centuries old cookbooks and way of the lives of our ancestors could keep me occupied for hours on end. 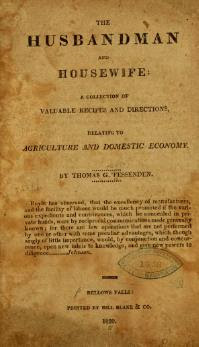 One of my favorite cookbooks is, of course, a Yankee cookbook dated 1772 called The Frugal Housewife. But this isn't even the oldest cookbook I have. 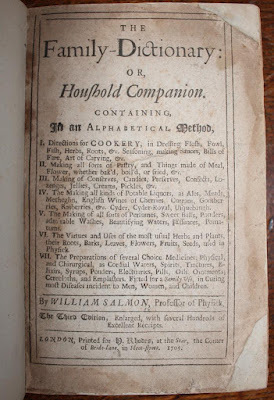 Enjoy these excerpts for some ancient cookbooks in my library, verbatim, misspellings and all. To Make Lumber Pie: Take a pound and a half fillet of veal, mince it with the same quantity of beef suet, season it with sweet spice, five pippins, a handful of spinach and a hard lettuce, thyme and parsley, Mix with it a penny loaf grated and the yolks of two or three eggs, sack and orange-flower water, sweet spice, a pound and a half currents and preserves, and a caudle. Hashed Venison: Should be warmed with its own gravy, or some without seasoning as before; and only warmed through, not boiled. If there is not fat left, cut some slices of mutton fat, set it on the fire with a little port wine and sugar, simmer till dry; then put to the hash, and it will eat as well as the fat of the venison. The American Domestic Cookery, 1822. To Make Venison Pasty: Raise a high round pie, shred a pound of beef suet, and put it into the bottom;' cut your venison in pieces and season it with pepper and salt. Lay it on the suet, lay on butter, close the pie, and bake it. The New England Cookery, 1808. To Recover Venison when it Stinks: Take as much cold water in a tub as will cover it a handful over, and put in good store of salt, and let it lie three of four hours. Then take your venison out, and let it lie in as much hot water and salt, and let it lie as long as before. Then have your crust in readiness, and take it out and dry it very well, and season it with pepper and salt pretty high, and put it your pastry. Do not use the bones of your venison for gravy, but get fresh beef or other bones. To Ficassee Chicken: Cut up the chicken raw, in the manner as you do for eating, and flat the pieces a little with a rolling pin. Fry them of a light brown; after wards put them into a stew pan, with sufficient quantity but not too much gravy, a spoonful or two of white wine, to two or three chickens, a little nutmeg and salt. Thicken it with flour and butter, ,garnish with sippets within the dish, and with crisp parsley on the rim. The Frugal Housewife, 1772. To Poach Eggs: Set a Stew pan of water on the fire; when boiling, slip an egg, previously broken into a cup, into the water, when the white looks done enough, slide an egg slice under the egg, and lay it on taste and butter or spinach. 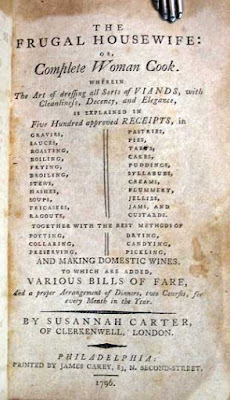 A New System of Domestic Cookery, 1807. To Preserve Eggs: May be preserved by anointing them with lard or any greasy or oily substance for months, and some say years. The oily substance closed the pores, hinder the access of air, and thus prevents putrefaction. they should be anointed soon after they are laid. The Husbandman and Housewife, 1820. To Make Turkey Pie: Bind the turkey, season it with savory spice, and lay it in the pie, with two capons cut in pieces,to fill up the corners. A goose pie is made the same way, with two rabbits to fill it up as aforesaid. 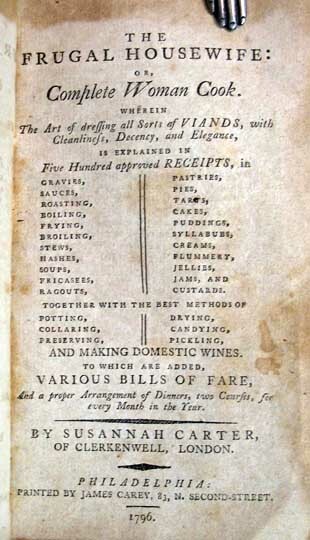 The Frugal Housewife, 1772. To Stuff a Turkey: Grate a wheat loaf, one quarter of a pound butter, one quarter of a pound salt pork, finely chopped, two eggs, a little sweet marjorum, summer savory, parsley, pepper and salt(If the pork be not sufficiently) fill the bird and sew it up. The same will answer for all wild fowl. Water fowls require onions. The same ingredients stuff a leg of veal, fresh pork, or a loin of veal. 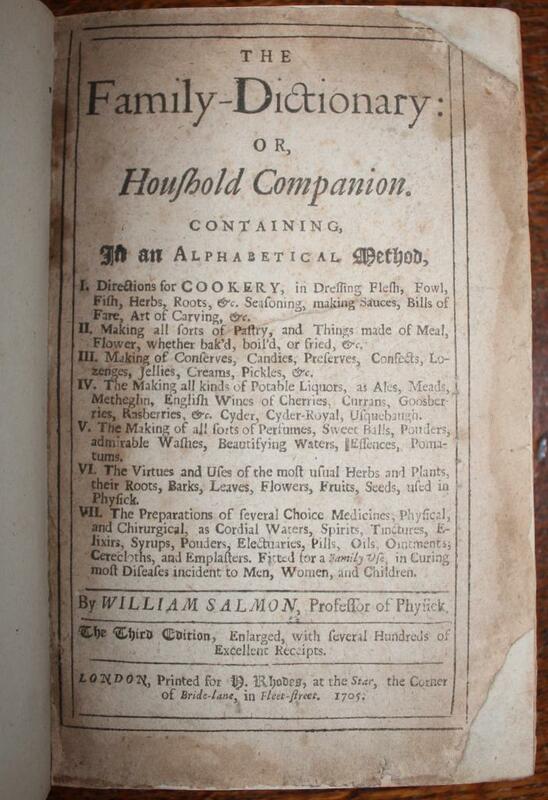 The New American Cookery, 1805. To Stew Pigeons: Stuff the birds with seasoning made of ground pepper, salt, mace and sweet herbs. Half roast them, then put them in a stew pan with a sufficient quantity of gravy. a little white wine, some pickled mushrooms and lemon peel. When stewed enough, take out the birds, thicken the liquor with butter and the yolks of eggs. 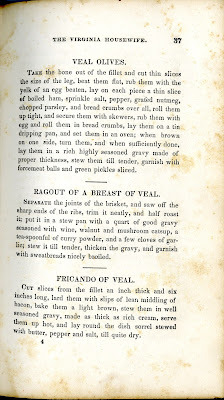 The New England Cookery, 1808. To Make Chouder: Take a bass weighing four pounds, boil half an hour; take six slices raw salt pork, fry them till the lard is nearly extracted; one dozen crackers soaked in cold water five minutes. Put the bass into the lard, also the pieces of pork and crackers, cover close, and fry for twenty minutes; serve with potatoes, pickles, apple sauce or mangoes. Garnish with green parsley. To Dress Cold Crab: Empty the shells, and mix the flesh with oil, vinegar, salt and a little white pepper and cayenne. Then put the mixture into the large shell and serve. Very little oil is necessary. 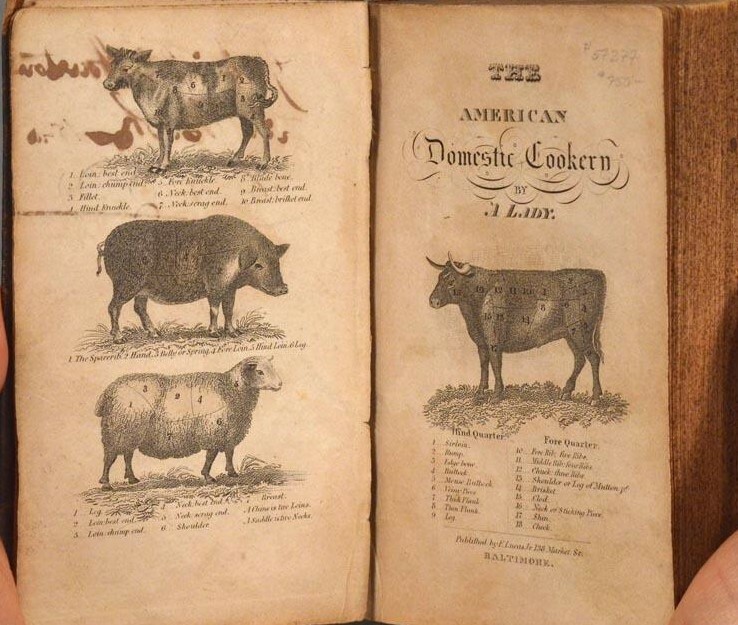 The American Domestic Cookery, 1822. To Make Hot Crab: Pick the meat out of a crab, clear the shell from the head, then put in the former, with a very small bit of nutmeg, salt, [pepper, a bit of butter,crumbs of bread, and three spoonfuls of vinegar, into the shell again, and set it before the fire. You may brown it with a salamander. Dry toast should be served to eat it upon. 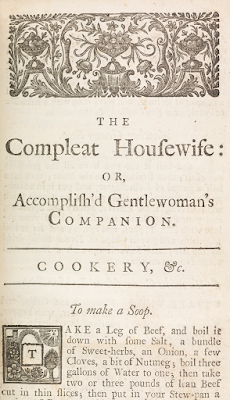 A New System of Domestic Cookery, 1807. To Boil Cod sounds: Soak them in warm water half an hour, then scrape and clean, and if to be dressed white, boil them in milk and water. When tender, serve them in a napkin, with egg sauce. The salt mush not be much soaked out, unless for fricassee. To Make Eel Broth: Very nourishing for the sick. Stew two hours and add an onion and [peppercorns; salt to taste. The American Domestic Cookery, 1822. To Make Eel Pie: Cut, wash and season them with sweet seasoning and a handful of currants, butter and close it. The Frugal Housewife, 1772. To Make Lobster Salad: Make a salad; and put some of the red part of the lobster to it, cut. this forms a pretty contrast to the white and green of the vegetables. Don't put much oil, as shell-fish absorb the sharpness of vinegar. Swerve in a dish, not a bowl. To Fry Muscles: Put them into a kettle, in which there is as much boiling water was will cover them. Being enough, take them up and beard them, then wash them in warm water, wipe them dry and flour them. Being fried crisp, dish them up with butter beaten with the juice of lemon and parsley throwed over them, fried crisp and green. To Make Oyster Pie: Parboil a quart of large oysters in their own liquor, mince them small, and pound them in a mortar, with pistachio nuts, marrow and sweet herbs, and onion and savory seeds, and a little grated bread; or season as aforesaid whole. Lay on butter and close it. To Pickle Oysters: Take a quart of oysters, and wash them in their own liquor very well, till all the grittiness is out. Put them in a sauce pan or stew pan and strain the liquor over them . Set them on the fire, and scum them; then put in three of four blades of mace, a spoonful of whole pepper-corns, when you think they are boiled enough, throw in a glass of white wine. Let them have a thorough scald; then take them up and when they are cold, put them in a pot and pour the liquor over them, and keep them for use, Take them out with a spoon. To Make Shrimp Sauce: Wash half a pint of shrimps very clean. Mince and put them in stew pan, with a spoonful of anchovey liquor and a pound of thick melted butter; boil it up for five minutes and squeeze in half a lemon. Toss it up and put it in a sauce boat. To Make a Strong Fish Gravy: Take two or three eels, or any fish you have, skin or scale them, gut them and wash them from grit. Cut them into little pieces, put them into sauce pan, cover them with water, a ;little crust of bread toasted brown, a blade or two of mace, some whole pepper, a few sweet herbs, and a little bit of lemon peel. Let it boil till it is rich and good, then have ready a piece of butter, according to your gravy: if a pint, as big as a walnut. Melt it in the saucepan, then shake in a little flour, and toss it about till it is brown, and then strain in the gravy to it. Let it boil a few minutes and it will be good. 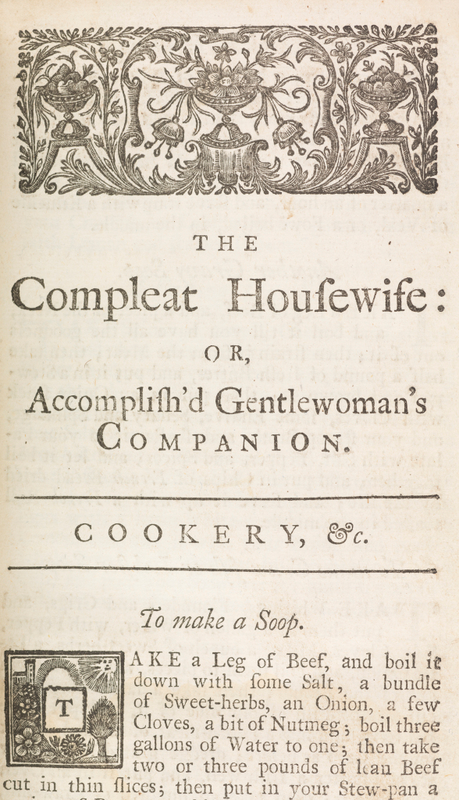 The Frugal Housewife, 1772.